Well, who would have guessed that the first year I missed Ceatec Japan, they had a presentation on Calligraphy. A research group at Keio University, led by Seiichiro Katsura, has developed the “Motion Copy System.” This system can identify and store detailed brush strokes based upon information about brush movements in calligraphy. This information has enabled a robot to faithfully reproduce these detailed brush strokes. The system stores calligraphy movements by using a brush wherein the handle and tip are separate. 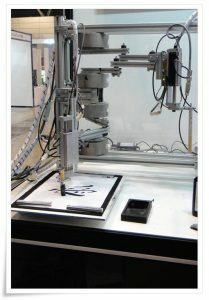 The two parts are connected, however, with the head as the “master system” and the tip as the “slave system.” Characters can be written by handling the device in the same way as one would handle an ordinary brush. Unlike conventional motion capture systems, the unique feature of this one is that it can record and reproduce the pressure applied to the brush as well as the sensation when you touch something. Until now, passing on traditional skills has depended upon intuition and experience. It is hoped that this new system will enable calligraphy skills to be learned more efficiently. Of two minds at least and rather fascinated, if one watches the whole video and listens to the explanations in Japanese with subtitles in English, it is quite enlightening, in my opinion. My practical question would be, laughing a little but think it is important, who is choosing the ink, who is in fact making the ink, what kind, and most of all what brush is being used, is it always the same, how often is it changed. In other words, basically, there has to be a calligrapher behind all of this as well. Fusion, technology and art, fascinating, but a robot alone can only do what people have created. Start the party of comments going, join in please.